Seven delightful villas sit on a two acre hillside admist the lush foliage of a hidden garden. The villas are each cleverly named after their tropical surroundings with the theme carried through the decor. With each villa artistically decorated and all unique, with enchanting murals and hidden delights for the eye to slowly reveal. The fully landscaped tropical garden boasts an ifinity edge swimming pool overlooking the beach and a central rock waterfall feature with a terrapin pond. Two bedroom Villas Pineapple, Mango, Avocado, Coconut and Cherry are very spacious and designed for maximum comfort and privacy inside and out. Each villa is air-conditioned and has a four-poster master bedroom with ensuite bathroom and second bedroom with twin queens and second ensuite bathroom, with walk-in closets throughout. All bedrooms have writing desks, safes, direct dial telephones, ceiling fans and reading nooks with bookshelves and comfy lounging that help you to while away a few stolen holiday moments. The villa windows all have mosquito screens. All bathrooms have double vanity sinks with recessed medicine cabinets, a large shower and a separate toilet. The kitchens are fully fitted with wooden cabinets and fine European stainless steel appliances, a gourmet cook's dream: fridge with freezer and ice maker, oven, dishwasher, microwave, coffee maker, blender along with all crockery and cooking utensils and a central island fitted with cooking hob and breakfast bar. The villas have a seating area, satellite TV, a CD player with stereo surroung and wireless internet access throughout the property. French sliding doors open onto spacious hardwood decks with bamboo privacy screens, a covered dining area and loungers to enjoy the truly spectacular coastline views. 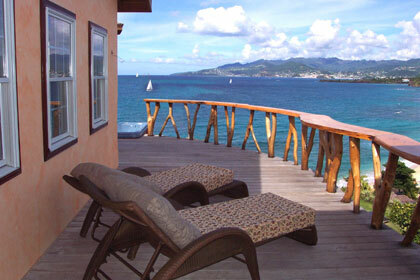 Relax in your private six-seater massaging hot tub on the sun deck, - day or night. Each villa has a private utility room complete with washing machine and dryer, ironing boards and irons for guest's personal laundry requirements.